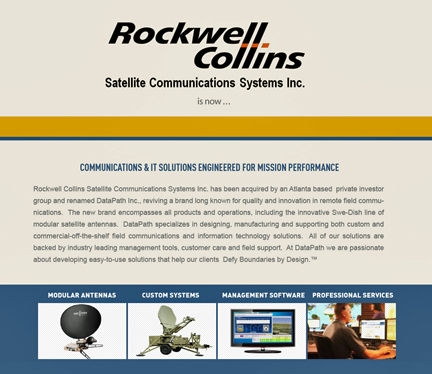 [SatNews] Rockwell Collins, Inc. (NYSE: COL) completed the sale of its satellite communications business. The business, which designs, manufactures and services ground-based satellite communication systems primarily for military customers, will be renamed DataPath, Inc.
“This transaction is part of a strategy to reshape our Government Systems portfolio to align with the changing dynamics of the defense environment, and focus on core products that will fuel future growth for the company,” said Rockwell Collins CEO and President Kelly Ortberg. The sale includes operations in Duluth, Georgia, and Stockholm, Sweden, and includes approximately 365 employees.